It's not as luxurious as the leathers that Furla typically works with, but there's a real charm about this molded rubber gel. 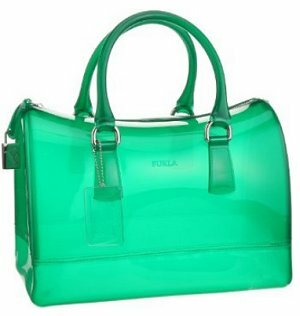 Its shamrock green luster is stunning, so I'm thrilled Furla allows it to dominate. A splash of silver in the handle rings and zippered top is the only respite from this hue. Kermit told us that it's not easy being green, but this Candy Jelly bag makes it seem effortless! Such a shock of color really calls for moderation, so I'm thrilled that this satchel is midsized. Any larger and it might have seemed overwhelming. We'll still be able to fit everything we really need inside it, although it's worth noting that the translucent rubber doesn't give us a lot of privacy. It's not as revealing as a clear bag, but you'll also see the outline of what you're carrying inside. Considering its rubber material, I think the Candy Jelly bag is overpriced at $295. However, it wasn't that long ago that Tod's was charging twice the price for its similar Gummy G-Bag tote. Affordable is certainly relative in the fashion world! The Furla Candy Jelly bag in passionfruit, an orange alternative to this green bag.